Patrick Lafcadio Hearn (/hɜːrn/; Greek: Πατρίκιος Λευκάδιος Χερν; 27 June 1850 – 26 September 1904), known also by the Japanese name Koizumi Yakumo (小泉 八雲), was a writer, known best for his books about Japan, especially his collections of Japanese legends and ghost stories, such as Kwaidan: Stories and Studies of Strange Things. In the United States, Hearn is also known for his writings about the city of New Orleans based on his ten-year stay in that city. A complex series of conflicts and events led to Lafcadio Hearn being moved from Greece to Ireland, where he was abandoned first by his mother (leaving him in the care of her husband's aunt), then his father, and finally by his father's aunt, who had been appointed his official guardian. In 1850 Hearn's father was promoted to Staff Surgeon Second Class and was reassigned from Lefkada to the British West Indies. Since his family did not approve of the marriage, and worried that his relationship might harm his career prospects, Charles Hearn did not inform his superiors of his son or pregnant wife and left his family behind. In 1852, he arranged to send his son and wife to live with his family in Dublin, Ireland, where they received a cool reception. Charles Hearn's Protestant mother, Elizabeth Holmes Hearn, had difficulty accepting Rosa Hearn's Catholicism and lack of education (she was illiterate and spoke no English). Rosa found it difficult to adapt to a foreign culture and the Protestantism of her husband's family, and was eventually taken under the wing of Elizabeth's sister, Sarah Holmes Brenane, a widow who had converted to Catholicism. Despite Sarah Brenane's efforts, Rosa suffered from homesickness. When her husband returned to Ireland on medical leave in 1853, it became clear that the couple had become estranged. Charles Hearn was assigned to the Crimean Peninsula, again leaving his pregnant wife and child in Ireland. When he came back in 1856, severely wounded and traumatized, Rosa had returned to her home island of Cerigo in Greece, where she gave birth to their third son, Daniel James Hearn. Lafcadio had been left in the care of Sarah Brenane. In 1861, Hearn's aunt, aware that Hearn was turning away from Catholicism, and at the urging of Henry Hearn Molyneux, a relative of her late husband and a distant cousin of Hearn, enrolled him at the Institution Ecclésiastique, a Catholic church school in Yvetot, France. Hearn's experiences at the school confirmed his lifelong conviction that Catholic education consisted of "conventional dreariness and ugliness and dirty austerities and long faces and Jesuitry and infamous distortion of children's brains.":p. 25 Hearn became fluent in French and would later translate into English the works of Guy de Maupassant, who coincidentally attended the school shortly after Hearn's departure. In 1874, Hearn and the young Henry Farny, later a renowned painter of the American West, wrote, illustrated, and published an 8-page weekly journal of art, literature and satire entitled Ye Giglampz. The Cincinnati Public Library reprinted a facsimile of all nine issues in 1983. The work was considered by a twentieth century critic to be "Perhaps the most fascinating sustained project he undertook as an editor." While working for the Commercial Hearn agreed to be carried to the top of Cincinnati's tallest building on the back of a famous steeplejack, Joseph Roderiguez Weston, and wrote a half-terrified, half-comic account of the experience. It was also during this time that Hearn wrote a series of accounts of the Bucktown and Levee neighborhoods of Cincinnati, "...one of the few depictions we have of black life in a border city during the post-Civil War period.":p. 98 He also wrote about local black song lyrics from the era, including a song titled "Shiloh" that was dedicated to a Bucktown resident named "Limber Jim." Char-Coal: Cartoon published in New Orleans Daily Item on 25 August 1880. During the autumn of 1877, recently divorced from Mattie Foley and restless, Hearn had begun neglecting his newspaper work in favor of translating into English works of the French author Gautier. He had also grown increasingly disenchanted with Cincinnati, writing to Henry Watkin, "It is time for a fellow to get out of Cincinnati when they begin to call it the Paris of America." With the support of Watkin and Cincinnati Commercial publisher Murat Halstead, Hearn left Cincinnati for New Orleans, where he initially wrote dispatches on the "Gateway to the Tropics" for the Commercial. At the end of 1881, Hearn took an editorial position with the New Orleans Times Democrat and was employed translating items from French and Spanish newspapers as well as writing editorials and cultural reviews on topics of his choice. He also continued his work translating French authors into English: Gérard de Nerval, Anatole France, and most notably Pierre Loti, an author who influenced Hearn's own writing style. : pp. 130–131 Milton Bronner, who edited Hearn's letters to Henry Watkin, wrote: "[T]he Hearn of New Orleans was the father of the Hearn of the West Indies and of Japan," and this view was endorsed by Norman Foerster. During his tenure at the Times Democrat, Hearn also developed a friendship with editor Page Baker, who went on to champion Hearn's literary career; their correspondence is archived at the Loyola University New Orleans Special Collections & Archives. Hearn also published in Harper's Weekly the first known written article (1883) about Filipinos in the United States, the Manilamen or Tagalogs, one of whose villages he had visited at Saint Malo, southeast of Lake Borgne in St. Bernard Parish, Louisiana. Hearn's former home on Cleveland Avenue in New Orleans is preserved as a registered historic place. At the time he lived there, Hearn was little known, and even now he is little known for his writing about New Orleans, except by local cultural devotees. However, more books have been written about him than any former resident of New Orleans except Louis Armstrong. Hearn's writings for the New Orleans newspapers included impressionistic descriptions of places and characters and many editorials denouncing political corruption, street crime, violence, intolerance, and the failures of public health and hygiene officials. Despite the fact that he is credited with "inventing" New Orleans as an exotic and mysterious place, his obituaries of the vodou leaders Marie Laveau and Doctor John Montenet are matter-of-fact and debunking. Selections of Hearn's New Orleans writings have been collected and published in several works, starting with Creole Sketches in 1924, and more recently in Inventing New Orleans: Writings of Lafcadio Hearn. Harper's sent Hearn to the West Indies as a correspondent in 1887. He spent two years in Martinique and in addition to his writings for the magazine, produced two books: Two Years in the French West Indies and Youma, The Story of a West-Indian Slave, both published in 1890. Lafcadio Hearn, shown with Koizumi Setsu. Note the way he is facing—he always preferred to be photographed this way so that his left eye could not be seen. In 1890, Hearn went to Japan with a commission as a newspaper correspondent, which was quickly terminated. It was in Japan, however, that he found a home and his greatest inspiration. Through the goodwill of Basil Hall Chamberlain, Hearn gained a teaching position during the summer of 1890 at the Shimane Prefectural Common Middle School and Normal School in Matsue, a town in western Japan on the coast of the Sea of Japan. The Lafcadio Hearn Memorial Museum and his old residence are still two of Matsue's most popular tourist attractions. During his fifteen-month stay in Matsue, Hearn married Koizumi Setsu, the daughter of a local samurai family, with whom he had four children. He became a naturalized Japanese, assuming the name Koizumi Yakumo, in 1896 after accepting a teaching position in Tokyo. After having been Greek Orthodox, Roman Catholic, and, later on, Spencerian, he became Buddhist. Kazuo, Hearn's son, aged about seventeen. 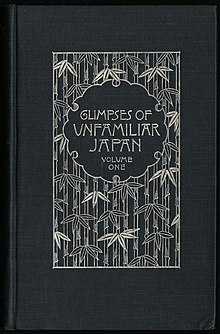 During late 1891, Hearn obtained another teaching position in Kumamoto, Kyūshū, at the Fifth Higher Middle School, where he spent the next three years and completed his book Glimpses of Unfamiliar Japan (1894). In October 1894, he secured a journalism job with the English-language newspaper Kobe Chronicle, and in 1896, with some assistance from Chamberlain, he began teaching English literature at Tokyo Imperial University, a job he had until 1903. In 1904, he was a professor at Waseda University. Hearn, who encountered judo in Japan at the end of the nineteenth century, contemplated its concepts with the awed tones of an explorer staring about him in an extraordinary and undiscovered land. "What Western brain could have elaborated this strange teaching, never to oppose force by force, but only direct and utilize the power of attack; to overthrow the enemy solely through his own strength, to vanquish him solely by his own efforts? Surely none! The Western mind appears to work in straight lines; the Oriental, in wonderful curves and circles. On 26 September 1904, he died of heart failure at the age of 54 years. His grave is at the Zōshigaya Cemetery in Toshima, Tokyo. In the late 19th century, Japan was still largely unknown and exotic to Westerners. However, with the introduction of Japanese aesthetics, particularly at the Paris Exposition Universelle of 1900, Japanese styles became fashionable in Western countries. Consequently, Hearn became known to the world by his writings concerning Japan. In later years, some critics would accuse Hearn of exoticizing Japan, but because he offered the West some of its first descriptions of pre-industrial and Meiji Era Japan, his work is generally regarded as having historical value. Hearn's grave, in Zōshigaya Cemetery. Admirers of Hearn's work have included Ben Hecht, John Erskine, and Malcolm Cowley. The Japanese director Masaki Kobayashi adapted four Hearn tales into his 1964 film, Kwaidan. Some of his stories have been adapted by Ping Chong into his puppet theatre, including the 1999 Kwaidan and the 2002 OBON: Tales of Moonlight and Rain. 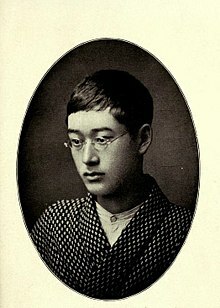 Yone Noguchi is quoted as saying about Hearn, "His Greek temperament and French culture became frost-bitten as a flower in the North." There is also a cultural center named after Hearn at the University of Durham. Hearn was a major translator of the short stories of Guy de Maupassant. The first museum in Europe for Lafcadio Hearn was inaugurated in Lefkada, Greece, his birthplace, on 4 July 2014, as Lefcadio Hearn Historical Center. It contains early editions, rare books and Japanese collectibles. The visitors, through photos, texts and exhibits, can wander in the significant events of Lafcadio Hearn's life, but also in the civilizations of Europe, America and Japan of the late eighteenth and early nineteenth centuries through his lectures, writings and tales. The municipalities of Kumamoto, Matsue, Shinjuku, Yaizu, Toyama University, the Koizumi family and other people from Japan and Greece contributed to the establishment of Lefcadio Hearn Historical Center. This article incorporates text from a publication now in the public domain: Chisholm, Hugh, ed. (1911). "Hearn, Lafcadio" . Encyclopædia Britannica. 12 (11th ed.). Cambridge University Press. p. 128. ^ a b Bisland, Elizabeth (1906). The life and letters of Lafcadio Hearn. 1. Boston: Houghton, Mifflin. ^ According to one of his biographers, a family Bible records 'Patricio Lafcadio Tessima Carlos Hearn, August 1850.' Kennard, Nina H. (1912). Lafcadio Hearn. New York: D. Appleton and Co.
^ a b c d e f g h i j k l m n Cott, Jonathan (1990). Wandering Ghost: The Odyssey of Lafcadio Hearn. New York: Knopf. ^ https://en.wikipedia.org/wiki/Wikipedia:Citation_needed. When 7 years old to unknown, short-lived woman?! Is this a prank? ^ Christopher Benfey, ed. (2008). Lafcadio Hearn: American Writings. New York: Library of America. ISBN 978-1-59853-039-1. ^ Grace, Kevin (4 January 2012). Legendary Locals of Cincinnati. Arcadia Publishing. p. 25. Retrieved 7 May 2013. ^ Harold Schechter, ed. (2008). True Crime: An American Anthology. Library of America. pp. 117–130. ISBN 978-1-59853-031-5. ^ Jon Christopher Hughes (Autumn 1982). ""Ye Giglampz" and the Apprenticeship of Lafcadio Hearn". American Literary Realism, 1870–1910. University of Illinois Press. 15 (2): 182–194. JSTOR 27746052. ^ Gale, Robert (2002). A Lafcadio Hearn Companion. Greenwood Press. pp. 179–180. ISBN 0-313-31737-2. ^ Norman Foerster (1934), American Poetry and Prose, Revised and Enlarged Edition, Boston: Houghton Mifflin, p. 1149; Hearn, Lafcadio (1907), Letters from the Raven: Being the Correspondence of Lafcadio Hearn with Henry Watkin, ed., Milton Bronner, New York: Brentano's. ^ "Lafcadio Hearn Correspondence Finding Aid" (PDF). J. Edgar & Louise S. Monroe Library, Loyola University New Orleans. Retrieved 16 July 2018. ^ Peggy Grodinsky (14 February 2007). "A chronicle of Creole cuisine". Chronicle. Houston. .
^ Lafcadio Hearn (1924). Charles Woodward Hutson (ed.). Creole Sketches. Boston: Houghton Mifflin Co. OCLC 2403347. ^ Starr, S. Frederick (2001). Inventing New Orleans: Writings of Lafcadio Hearn. University Press of Mississippi. ISBN 1-57806-353-1. ^ "Two Years in the French West Indies". World Digital Library. Retrieved 22 August 2017. ^ Hearn, Lafcadio (1890). Youma: Story of a Western Indian Slave. New York: Harper & Brothers. ^ Norman Foerster (1934), American Poetry and Prose, Revised and Enlarged Edition, Boston: Houghton Mifflin, p. 1149. ^ Law, Mark (2007). The Pyjama Game: A Journey Into Judo (2008 ed.). London: Aurum Press Ltd. p. 41. ^ MacAdams, William (1995), Ben Hecht, Barricade, p. 34, ISBN 1-56980-028-6 . ^ Cowley, Malcolm (1949), "Introduction", in Goodman, Henry (ed. ), The Selected Writings of Lafcadio Hearn, Citadel . ^ Noguchi, Yone (1910), Lafcadio Hearn in Japan, New York: Mitchell Kennerley. ^ "Bibliography", Lafcadio Hearn, Trussel . Amenomori, Nobushige (1905). "Lafcadio Hearn, the Man," The Atlantic Monthly, October 1905. Bisland, Elizabeth (1906). The Life and Letters of Lafcadio Hearn, Vol. II, New York: Houghton, Mifflin & Company. Cott, Jonathan (1992), Wandering Ghost: The Odyssey of Lafcadio Hearn, Kodansha International . Dawson, Carl (1992). Lafcadio Hearn and the Vision of Japan, Johns Hopkins University Press. Hearn, Lafcadio (2001), Starr, S Frederick (ed. ), Inventing New Orleans: Writings of Lafcadio Hearn, University Press of Mississippi . Kennard, Nina H (1912), Lafcadio Hearn, New York: D. Appleton & Co .
Kunst, Arthur E. (1969). Lafcadio Hearn, Twayne Publishers. Langton, D. H. (1912). "Lafcadio Hearn: Journalist and Writer on Japan," The Manchester Quarterly, Vol. XXXI. Lurie, David (2005), "Orientomology: The Insect Literature of Lafcadio Hearn (1850–1904)", in Pflugfelder, Gregory M; Walker, Brett L (eds. ), JAPANimals: History and Culture in Japan's Animal Life, University of Michigan Press . Mais, S. P. B. (1920). "Lafcadio Hearn." In Books and their Writers, Grant Richards, Ltd.
McWilliams, Vera (1946). Lafcadio Hearn, Houghton Mifflin Company. Miner, Earl Roy (1958). The Japanese Tradition in British and American Literature, Princeton University Press. Monaham, Michael (1922). "Lafcadio Hearn," An Attic Dreamer, Mitchell Kennerley. More, Paul Elmer (1905). "Lafcadio Hearn." In Shelburne Essays, Second Series, G. P. Putnam's Sons. Noguchi, Yone (1905). "Lafcadio Hearn, A Dreamer," National Magazine, Vol. XXII, No. 1. Noguchi, Yone (1910), Lafcadio Hearn in Japan, New York: Mitchell Kennerley . Pulvers, Roger (19 January 2000), "Lafcadio Hearn: Interpreter of Two Disparate Worlds", Japan Times, Trussel . Rexroth, Kenneth (1977), The Buddhist Writings of Lafcadio Hearn . Rothman, Adam (2008), "Lafcadio Hearn in New Orleans and the Caribbean", Atlantic Studies, 5 (2) ; republished in New Orleans in the Atlantic World: Between Land and Sea, Routledge, 2013 . Setsu, Koizumi (1918). Reminiscences of Lafcadio Hearn, Houghton Mifflin Company. Starrs, Roy (2006), "Lafcadio Hearn as Japanese Nationalist" (PDF), Nichibunken Japan Review: Journal of the International Research Center for Japanese Studies (essay), JP: Nichibun (18): 181–213 . Thomas, Edward (1912). Lafcadio Hearn, Houghton Mifflin Company. Wikimedia Commons has media related to Lafcadio Hearn. "Lafcadio Hearn and Haiku", Modern haiku (essay) . Dirda, Michael, "The Ghost Stories of Lafcadio Hearn", Library without walls (review), Barnes & Noble .